I sketch this awhile ago when we bought our fish for our aquarium, and have now applied the colour! At the time we went to see a film documenting artists from the Torres Straits making their journey over to Australia for their exhibition. In this film I spotted one of the artists carried a guitar in their shopping bag as if it was the most treasured position that they always carried with them. 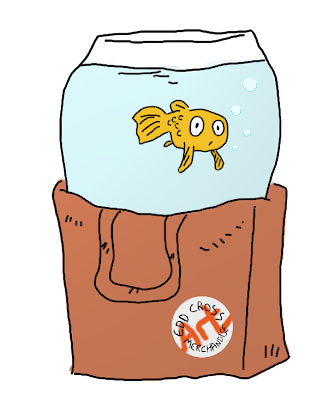 So I shared that thought and wondered about carrying my treasured goldfish around with me in a shopping bag!